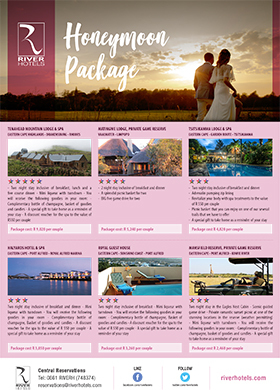 Situated along the Kowie River in Port Alfred, Mansfield Game Reserve lies nestled amongst 1000 acres of lush, undulating grassland and thornveld plateaus. Vegetation here is typical Eastern Cape sweetveld and bush, with the landscape and kloofs providing the ideal habitat for rare cycads, Sneezewood, Yellowwood, and Knobthorn trees, to name but a few. Choose from a variety of accommodation - from indoor lodging to outdoor camping and caravanning. 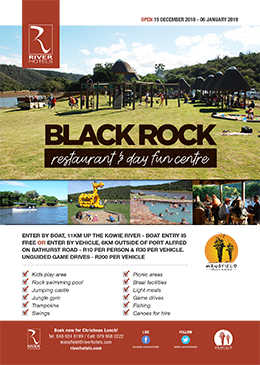 Mansfield offers beautiful picnic and braai/BBQ spots, overlooking the river and next to a children's play area. 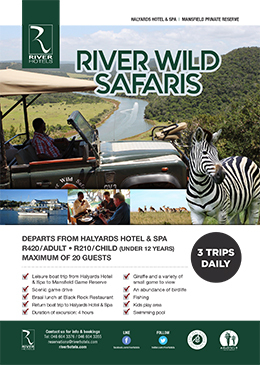 Other activities include hiking, fishing, canoeing, bird watching and game drives. Find a wide variety of game to view, including giraffe. The full amount is required within 48 hours from booking in order to guarantee your reservation. Platforms offer very basic camping-style accommodation. Platforms are made up of a wooden floor, roof and three sides, covered with shade cloth. The front of the platform is open, but can be made more private with the roll-down shade cloth blind. There are 3 platforms available, and each can sleep up to 10 people. 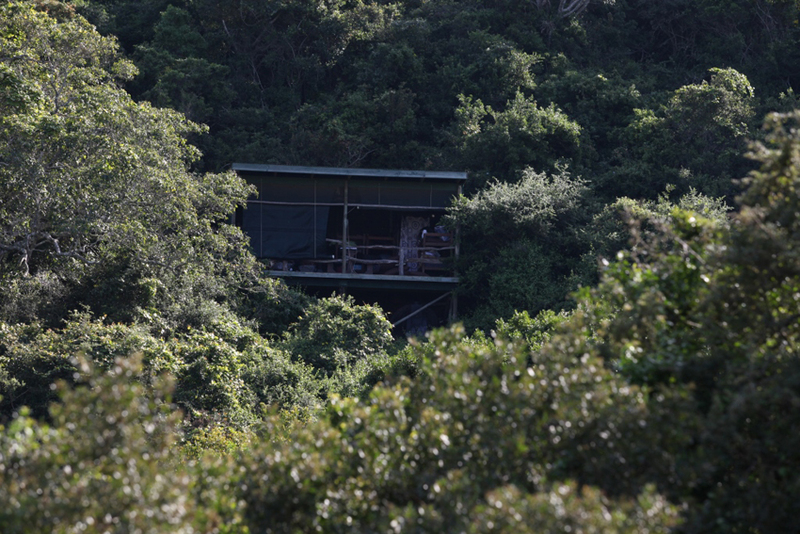 Platforms are self-catering, with braai/BBQ facilities available (wood at extra cost). Please note that there is no electricity included, but generator power is available on request, at an hourly rate. Platforms are equipped with single bunk beds and mattresses (guests to provide their own linen, cutlery, crockery, cooking utensils and so forth, as with camping), gas geyser, shower and toilet. Camp sites are situated a mere 50km from the Kowie River. Camp sites are self-catering, with braai/BBQ facilities available (wood at extra cost). Although electricity is not included, generator power is available on request, at an hourly rate. 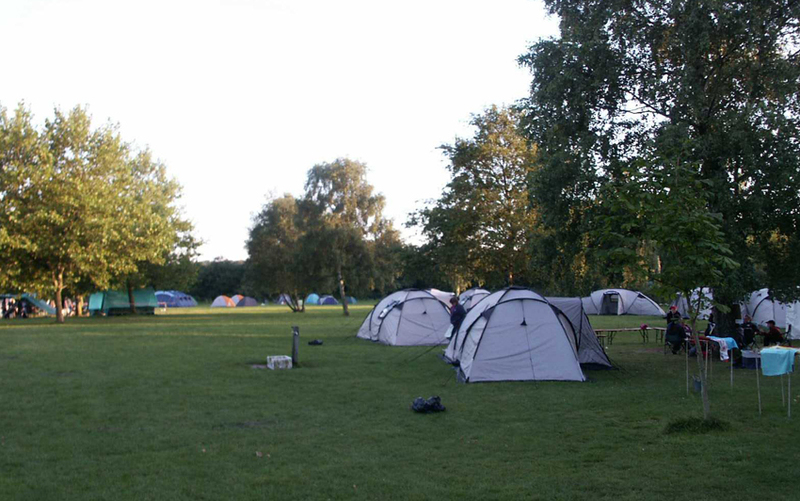 Camp sites are equipped with communal, open air ablutions with hot water showers and toilets. 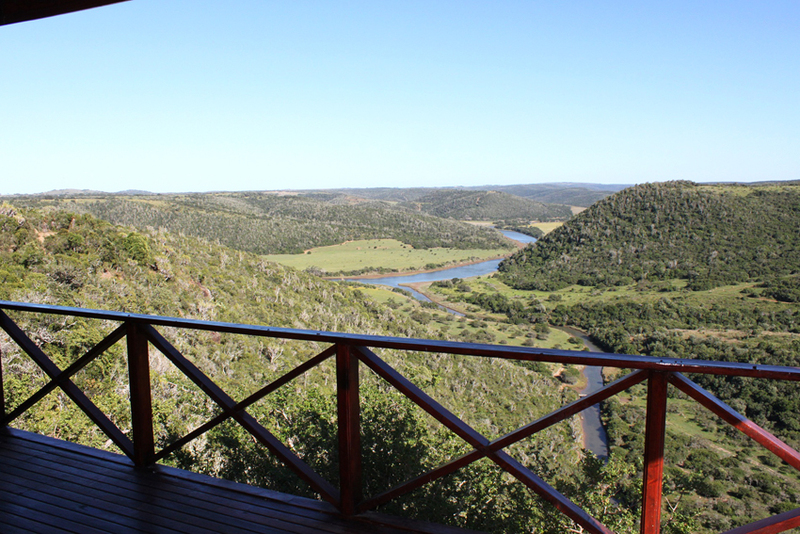 Eagle's Nest is an open plan log cabin with beautiful, panoramic views over the Kowie River. The cottage is self-catering, and all linen, cutlery and crockery is provided. There is a small gas fridge as well as a small gas stove for food storage and preparation. Braai/BBQ facilities are available - braai wood, firelighters and matches are included. As the cabin does not have electricity, lights are battery-operated and paraffin lamps are made use of. The cabin is equipped with double bed, bunk bed, shower (hot water powered by an old-fashioned donkey-boiler) and toilet. 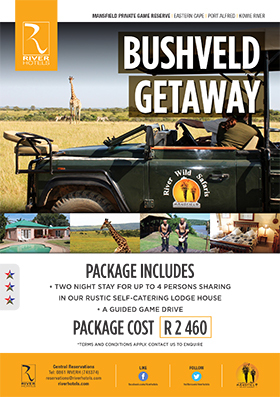 The lodge provides a setting for the ideal family getaway, as it sleeps up to 7 persons. Linen is provided. 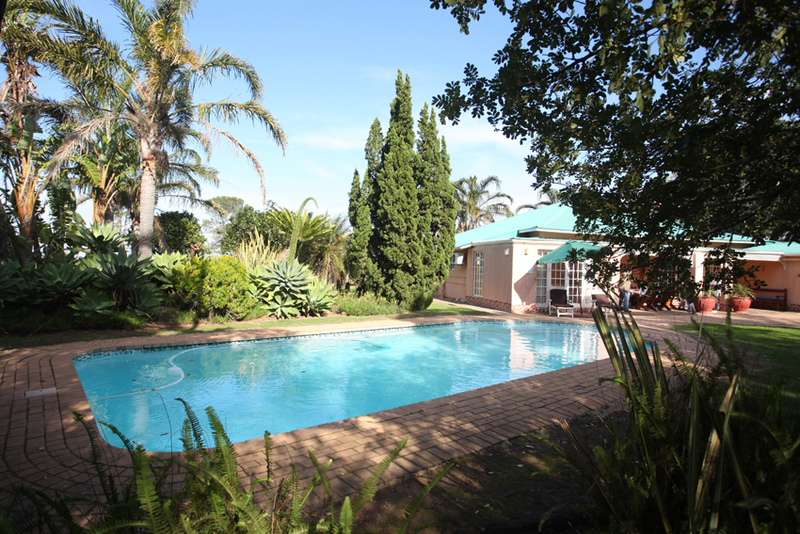 The farm house is powered by electricity and is self-catering with a large, fully equipped kitchen. Braai/BBQ facilities available. Enjoy a swim in the private swimming pool, set just outside the lodge. 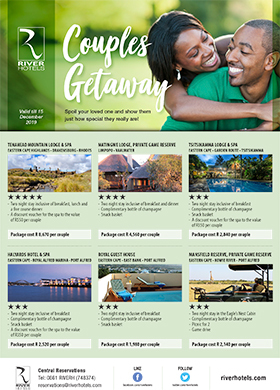 The lodge is equipped with 3 bedrooms, all with double bed, lounge and TV with selected DSTV channels, 2 en-suite bathrooms with bath, shower and toilet, separate bathroom with shower and toilet. Get on the N2 Highway to Grahamstown. After 50 km's, take the exit to Grahamstown and then after another 500 m's, take the R72 exit to Port Alfred. At the T-junction turn right towards Port Alfred. 50 km's on that road to Alexandria, then 25 km's to Kenton-on-Sea, and 25 km's to Port Alfred. Upon reaching Port Alfred, continue straight follow the road to East London. At the traffic lights, continue straight, over the bridge. Continue straight past the Royal Alfred Marina and continue towards East London. Take the R67 for Grahamstown / Bathurst, sign posted on your left as leaving Port Alfred. Continue for approximately 6-7km. Mansfield Reserve is sign posted on your left. Take the R72 direct to Port Alfred/Port Elizabeth. Pass the Fish River Sun. Pass Kleinemonde. 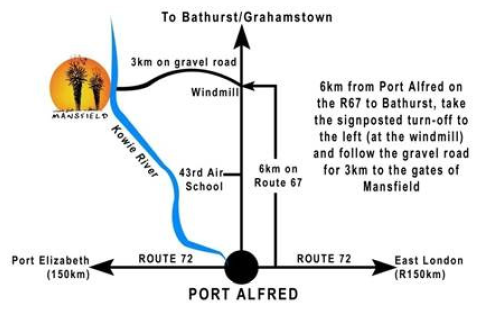 Upon reaching Port Alfred take the R67 to Grahamstown / Bathurst, sign posted on your right. Continue for approximately 6-7 km. Mansfield Reserve is sign posted on your left.